Wild: Pachyrhinosaurus Mitisaura is a medium-sized herbivore, found almost everywhere but the island’s mountains. It is generally calm, and ignores all other nearby creatures unless it is attacked, at which point it usually tries to flee. Domesticated: Pachyrhinosaurus is an excellent starting mount for anyone new to taming. It is fairly easy to train, can carry enough to be a simple pack-animal, and is not as deadly as some of the larger herbivores. Additionally, Pachyrhinosaurus can release it’s unique chemical on command to protect itself and it’s rider from nearby predators, or draw attention if desired, making it a potential life saver in a pinch. 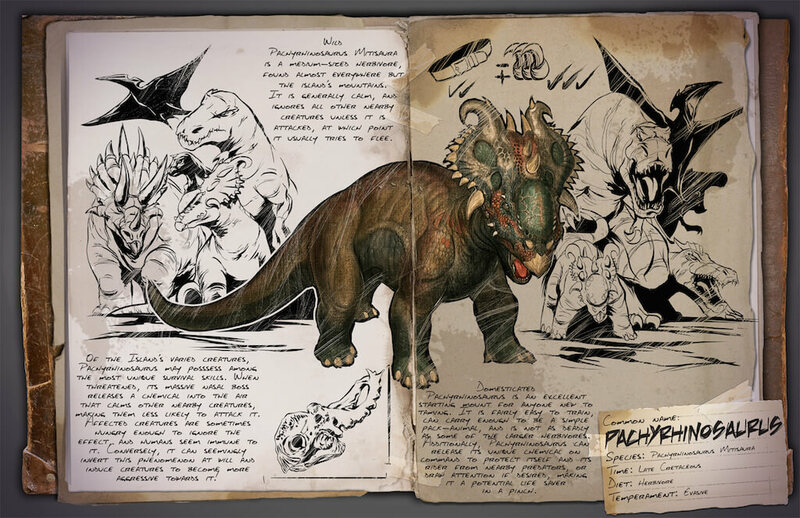 Known Information: Of the island’s varied creatures, Pachyrhinosaurus may possess among the most unique survival skills. When threatened, it’s massive nasal boss releases a chemical into the air that calms other nearby creatures, making them less likely to attack it. Affected creatures are sometimes hungry enough to ignore the effect and humans seem immune to it. Conversely, it can seemingly invert this phenomenon at will and induce creatures to become more aggressive towards it!